Happy Monday everyone! How is everyone doing? Any fun things planned for the week? As promised I'm looking to post on a more continuos basis so let's hope I keep it up! Anyways, let's get down to the point of the post! I'm almost positive all of you have seen this guy but I just came across him and thought I would feature two of his videos. 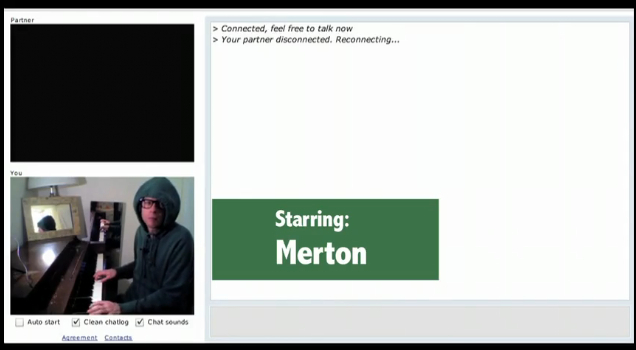 His name is Merton and he freestyles with random chat roulette users with his piano. I talked about chat roulette the first time during easter weekend when I posted about Dr. Pepper and their april fools joke! I thought that was pretty good but this right here certainly tops it. Though I must admit the people who hang out on chat roulette are either extremely young or appear to be extremely lonely, I don't know that's just my take. If anyone has ever used it leave a comment and let me know what you thought! I would love to hear about it. Anyways, let me go ahead and post the videos and as always feel free to leave your comments below! Have a great Monday! Thanks for the Videos, i think the piano man has a great concept to turn chatroulette into something spezial :) ....better then all the other perverts how are on this website. Anytime! I'm glad you enjoyed the videos! I agree, I like how people have found unique ways to turn chatroulette into something much better!